Big news! Lesbians Who Tech is thrilled to announce that Megan Smith, America’s CTO and former Google X VP, will be one of the keynote speakers at the Lesbians Who Tech Summit on Feb 27, 2015. 1. 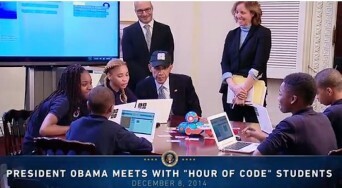 She helped President Obama learn to code. 2. She’s the highest ranking lesbian government official. 3. She was CEO of the first online platform connecting the queer community, PlanetOut.com. 4. She mentors women in tech and highlights our stories, both current and historic legends we all need to know. 5. She’s a huge supporter of Lesbians Who Tech, not only did she speak last year at the Summit, but she spent the entire day with us. Join the Lesbians Who Tech Summit, February 26 – March 1, 2015, in San Francisco. Details. The Summit is Lesbians Who Tech’s marquee event, bringing together over 1,000 LGBTQ women (and allies) across all areas of technology. The Lesbians Who Tech Summit is the only event focused on increasing visibility and tech participation in two historically underrepresented communities: the women’s and queer communities. Join us for our second annual summit starting on February 26 and ending March 1, 2015, in San Francisco, the epicenter of the technology industry. Through this summit and future endeavors, we will bond together to demonstrate our shared commitment to these two critical groups in the tech world. The Lesbians Who Tech Summit will bring together hundreds of queer women in tech (and the people who love them), for the most unique technology conference ever. We will be highlighting incredible queer women who are the next generation of technical leaders, as well as the people who have paved the way. Posted February 12th, 2015 & filed under Blogs.